Although men and women both actively participate in resistance projects, Sahrawi women facilitate most of the communication between non-violent activists from one city to another in this under-reported struggle. 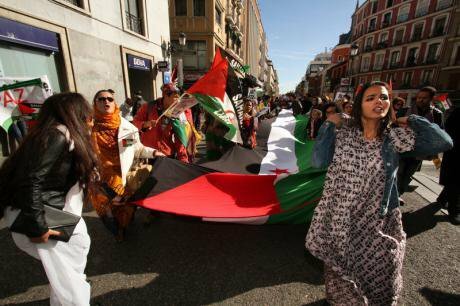 Rally for Western Sahara’s freedom: Madrid, November, 2014. Jose_Hinojosa/Demotix. All rights reserved.On June 15, 2014 I witnessed groups of peaceful demonstrators beaten to the ground and forcefully moved off of the streets and followed to their homes. Most shockingly, a woman was punched in the face and moved off of the sidewalk into the path of oncoming traffic. Every 15th of the month there is an organized nonviolent demonstration throughout the major cities of the occupied territories of Western Sahara: El Aaiún, Smara, Dakhla, and Boujdour. The largest demonstration is in El Aaiún on Smara Street, which is the most heavily populated city in the territories. This city is also where the most prominent and vocal activists live, notably Aminatou Haidar and Muhammad Dadash. In preparation for the monthly demonstration, the Moroccan security forces line the length of Smara Street. Police officers keep one hand on their weapons, riot police are fully dressed in riot gear from head to toe, and multiple armored vehicles crowd the street corners of connecting streets and alleyways. Although unarmed civilians lead the monthly demonstrations, the Moroccan security forces use excessive force to prevent many protesters from gathering on the street. The response of the security forces this time was not an isolated event. According to numerous Sahrawi activists, this is the result of engaging in resistance and attempting to express themselves in public. At the start of the military occupation in 1976, many Sahrawi men joined the liberation army and fought against the Moroccan state for several years. In their absence, Sahrawi women were primarily responsible for their household, children, and finances. At the same time, many women reported to the Frente Polisario about the internal dynamics of the occupation. Those who worked as informants for the opposition were arrested and unlawfully imprisoned by the Moroccan state. Many women, forcefully, were unexpectedly separated from their families and children and locked away for up to 11 years. They were tortured, interrogated, and abused all throughout their prison term in secret prisons located throughout the occupied territories and Morocco-proper. During a field-study conducted in the summer of 2014, I interviewed dozens of women who had been tortured and imprisoned in the 1980s. They were released in 1991 by the Moroccan government due to the pressure imposed by the United Nations. All of the activists interviewed are still actively involved in the resistance movement and have been since their release. Even after years of torture, injustice, and mass human rights violations they were not deterred from participating in the fight for self-determination. Today, the majority of the protesters on the street are Sahrawi women. This is representative of the greater composition of Sahrawi activists throughout the occupied territories. Although men and women both actively participate in resistance projects, Sahrawi women facilitate most of the communication between activists from one city to another. They organize protests, mediate activist press conferences, work in clandestine journalism, and collaborate with international human rights organizations on a consistent basis. While the primary objective of the resistance projects is the achievement of self-determination, the primary method of resistance is nonviolent. Both men and women activists emphasize the importance of pacifism and draw on international law to support their cause. Since the brokering of the ceasefire by the United Nations, Sahrawi activists have been fully dedicated to peaceful methods of protest and resistance in the face of violent state suppression. The means of resisting the occupation and organizing resistance projects form a significant part of social life in this part of Western Sahara. Families gather around a television set at home that is constantly turned on to RASD TV, which is the national television station run by the Frente Polisario. Images of the Sahrawi liberation army and female soldiers appear in every other commercial break, as well as the martyr and founder of the opposition: al-Wali Mustafa As-Sayyid. Politics and political resistance is a matter for daily discussion, consistently visible in daily life. Outside the family, activists visit one another on a regular basis. Sahrawi women often facilitate these gatherings by inviting friends and colleagues over to their homes. They share stories of injustice and human rights abuses from other cities in the territories. They keep each other informed about resistance activities led by other activists. Why is this so under-reported? While discussion of the conflict dominates social life here, the Western Sahara question receives very little international media attention. In recent years there have been a handful of articles that focus on the prominent role of Sahrawi women in political resistance. However, this focus has been systematically prevented from entering the occupied territories. Instead the coverage has focused on the leadership of Sahrawi women in the refugee camps located in Tindouf, Algeria. So how does a conflict that began in 1976 and a nonviolent resistance movement that has existed for decades go into relative anonymity? This is largely due to the efficiency of the Moroccan military occupation. The Moroccan state has established a level of surveillance that tightly regulates the flow of foreign visitors into the Occupied Territories. Because of the surveillance, few journalists have successfully entered the region and reported from within. In July 2014, a German journalist and his British colleague entered the territories to report on the monthly demonstration. Within hours they were searched, questioned, and sent out of the Occupied Territories and back into Morocco-proper. This is one small example of the efficiency of the Moroccan occupation to track foreign visitors, expel them from the territories, and effectively prevent any coverage of human rights violations and violence.